Price Changed to $579,900 in South Lake Tahoe! 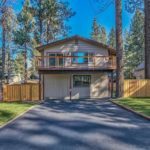 1027 Glen Road, South Lake Tahoe CA offered at $579,900Just like NEW! This completely remodeled home is 2 minutes from Heavenly Ski Resort, casinos and Lake Tahoe. A local, admired builder, Morgan Amsden did his Magic on this home and brought it current with beautiful finishes of natural ash cabinets throughout, pine doors, pine base boards, 3 new wall heaters, triple pane windows and high end fixtures. You get both modern and mountain finishes for...Continue Reading!